I first had this dish in a Portland restaurant specializing in Irish cuisine. Hot and hearty, it’s perfect for a winter supper or pot luck. I like to serve this with Irish Soda Brown Bread and lots of butter. This recipe adapted from The Irish Heritage Cookbook, by Margaret M. Johnson (1), serves 4. The original recipe only uses potatoes, carrots and onions for the veggies, but the addition of parsnips and kale are part of the Irish tradition: before the introduction of potatoes into European kitchens, parsnips were used much the same as we use potatoes today; and all forms of cabbage are used throughout Irish cuisine. If you cannot find kale, you can use cabbage, especially bok choy, savoy or napa cabbage. You may not be familiar with parsnips (carrot’s sweeter cousin), but they are especially good in this recipe, and have a lot of nutrient value, so do use them. Although the recipe calls for onions, I had a surplus of leeks from my CSA bounty, so I decided to use them, sliced crosswise every ½ inch. Excellent! 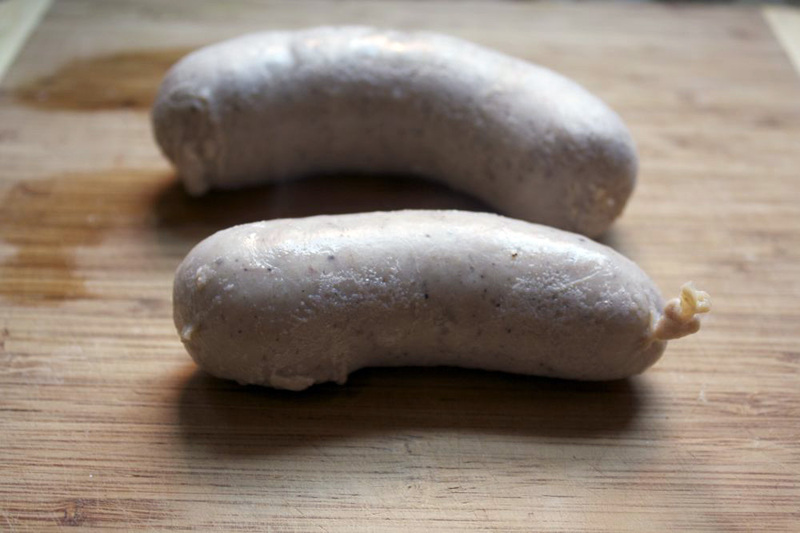 For the sausages, use pork, or pork and veal, such as Bangers or Bratwurst, if you cannot get Irish sausages. Do not use breakfast sausages–they have the wrong flavor. If you want to make your own Bangers, see The Paupered Chef (3) for a good photo essay on making making the sausages, including making the rusk – dried bread – used in the Bangers. Serves 4 – 6 (see below for variation for 2 servings). Photo right, is casserole I use for this recipe. 8 pork (or pork and veal) sausages, each about 5 inches long. 3 – 4 pork (or pork and veal) sausages, each about 5 inches long. 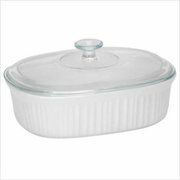 large covered casserole (or 2 smaller ones), or ovenproof Dutch oven for full recipe; smaller casserole for 2-serving recipe; either with lid. 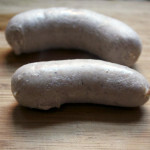 Prep sausages: Place sausages in a cast iron skillet. Puncture sausages in several places with the tines of a fork. Scatter bacon pieces around the sausages in the skillet. Add filtered water to cover; bring to a boil over medium high heat. Cover, reduce heat to simmer, and cook 10-15 minutes, until slightly tender. Meanwhile, prepare veggies: Wash potatoes and cut each into 4 or 6 wedges (Do not peel). If you can find small red potatoes (about the size of a half dollar), you can leave them whole, or cut in half. Scrub un-peeled carrots (and parsnips, if using); cut into ¾” to 1″ lengths (the fatter, the shorter). Remove papery peel from onions, cutting off root end. Cut onions in half lengthwise, and then cut each half cross-wise into ½ inch slices. Or if using leeks, use white and barely-green part, cut into ½” slices crosswise. Wash, dry and chop parsley leaves. Wash and dry the kale. Cut the leaves from the stem; roughly chop. Oven braise: Preheat oven to 350°F. Cut each sausage into 3 – 4 segments (about 1 ½ inches long). Transfer half of the sausages and bacon to large casserole; arrange half of each of the veggie slices around the sausage pieces. Sprinkle with a bit of fresh or dried thyme and chopped parsley, to taste. Then repeat with remaining sausages and bacon, veggies, and sprinkling of thyme and parsley. Pour sausage broth over the stew and add more filtered water to nearly cover. Tear off a length of waxed paper and fit over the top of the casserole; then cover with the lid (or if there is no lid, seal with aluminum foil). Place casserole in heated oven, and bake until veggies are tender, about 1 hour. Remove lid and waxed paper. Taste broth; season with salt & pepper to taste. Some sausages provide enough seasoning so that additional salt & pepper are not needed. Stir gently. Replace waxed paper and lid, and bake another 10 minutes. Serve hot. Serve directly from the casserole dish or serving bowl, with a ladle or large spoon, and accompany with slices of Irish Soda Brown Bread arranged on a bread board, around a pot of whipped butter (or honey and butter). This entry was posted in Baked, Leafy Veggie, Meat, Root Veggie, Simmered and tagged bacon, carrot, herbs, Irish, kale, onion, parsnip, pork, potato, sausage, veal. Bookmark the permalink.